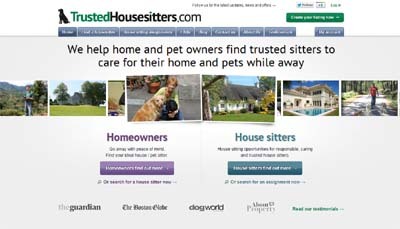 Trusted Housesitters connects home and pet owners with trustworthy, reliable and recommended sitters worldwide. The site provides a perfect win-win scenario between the two groups: pet and home owners get someone to look after their home and pets whilst they’re away (in most cases for free), and sitters get free accommodation, enabling them to stay in another country rent-free in exchange for a few daily chores such as dog walking & pool cleaning. Pet sitting agencies: most Trusted Housesitters members sit for free unlike traditional pet sitting agencies. Kennels & Catteries: Pets can stay at home, rather than being locked up. Again, since most sitters also offer their services for free, a considerable saving is available to pet owners. Sites like Dogvacay and Rover.com: These sites require you to send your pet to someone else (all of whom charge for the service). Here your pet doesn’t have to go to a new environment, they can get the same walks, the same food and the same treatment as they’re used to.